"...the peace negotiations between the Orthodox [Christian] Serbs, the Catholic Croats and the Muslim Bosnians had collapsed again. And there is no doubt that the religions that are so involved here had neglected in the period of more than forty years since the Second World War to engage in mourning, honestly confess the crimes which had been committed by all sides in the course of the centuries, and ask one another for mutual forgiveness....I think there can be no peace among the nations without peace among the religions!" Hans Küng and Karl-Josef Kuschel, commenting in 1993 on conflict within the former Yugoslavia. 1 Although this quotation refers to Bosnia, not Vojvodina, the principle is the same: a missed opportunity in the past and religious intolerance in the present. A religious/ethnic conflict is escalating in Vojvodina, (Vajdaság in Hungarian) the northern-most province of the Federal Republic of Yugoslavia. 350,000 inhabitants of the province are ethnic Hungarians. They are being pressured by the central government to abandon their homes and leave the country. The conflict has not yet reached the level of a civil war or genocide. However, if the past history of Croatia, Bosnia and Herzegovina, and Kosovo is any indication, the destruction of the ethnic Hungarian minority community is just a matter of time. FYROM refers to the "Former Yugoslav Republic of Macedonia"
Is the Vojvodina crisis an ethnic conflict or a religious conflict? The ethnic Hungarians in Vojvodina, like the citizens of Hungary, are mostly Roman Catholic. The government of Yugoslavia is controlled by Serbs, of whom the vast majority are members of the Serbian Orthodox Church. Although both faith groups are Christian, religious hatreds between the two run deeply. The situation in Vojvodina is significantly different from that in Kosovo, where a main cause of the strife is inter-religious rather than intra-religious. The conflict in Kosovo is between the Serbian central government and the ethnic Albanians. The Albanians are mainly Muslim, with Roman Catholic and Serbian Orthodox minorities. Ethnic Hungarians who are mainly Roman Catholic. At various times during the past millennium, Yugoslavia found itself straddling the borders of three faith groups: Islam, Orthodox Christianity, and Roman Catholicism. An essay is available which describes the history of Yugoslavia and surrounding area. Yugoslavia has been gradually disintegrating since the death of Tito. The country lost much of its territory and population during the 1990's as Slovenia, Croatia, Macedonia and Bosnia-Herzegovina achieved independence. As of 1999-APR, Yugoslavia consists of only four remaining provinces: Vojvodina, Serbia, Montenegro and Kosovo. Montenegro has a large degree of local autonomy. The government and Serbian people of Yugoslavia are totally opposed to losing any more territory to independence or autonomy movements. By the close of World War 1, ethnic Hungarians formed 41% of the population of Vojvodina. In late 1918, a National Assembly was held to decide whether Vojvodina should become part of Serbia. The area was under Serbian military occupation at the time. The vote was heavily in favor of Serb rule. This outcome was not surprising, because over 98% of the assembly delegates were Serbs. In 1920, control of the area was formally transferred from the Kingdom of Hungary to Serbia with the signing of the Treaty of Trianon. The area enjoyed relative peace, protected by treaties which guaranteed Vojvodina autonomy after both World Wars. 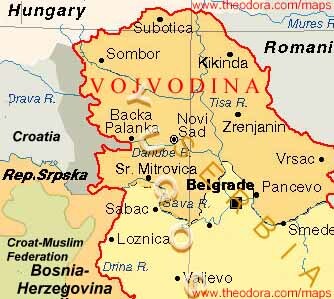 The autonomy of both Vojvodina and Kosovo provinces was further protected by an addition to the Yugoslavian constitution in 1974. 1980's: Tito died. He had rigidly controlled Yugoslavia since the end of World War II. The 30 ethnic groups in Vojvodina coexisted with little friction except for some discrimination by the Serbs against the Hungarians and Croats. 1987: While investigating allegations that the minority Serbs in Kosovo were being attacked by the ethnic Albanian majority, Slobodan Milosevic had promised his fellow Serbs that "No one will ever beat you again." Milosevic quickly became a Serbian hero. 1989: Milosevic was able to force changes to the Yugoslav constitution through its Parliament. 3 This terminated the autonomous status of the provinces of both Vojvodina and the southern province of Kosovo. 1990: The Democratic Community of Vojvodinan Hungarians (VMDK) was organized to promote autonomy for the province. The central government has refused to even discuss the matter. 1991-1995: One byproduct of the Croatian civil war (1991-1992) and of the Bosnian civil war (1992-1995) was the displacement of hundreds of thousands of Serbs. 130,000 to 200,000 were settled in Vojvodina. The Hungarian Human Rights Monitor claimed on 1996-JUL-7 that: "In many cases the settlers from Krajina have moved in by force into Hungarian homes while the Serb authorities failed to intervene. The Serb settlers from Krajina region are placed above the law and they receive preferential treatment over the indigenous Hungarian population in the areas of employment, housing and social assistance." 5 The European Parliament urged Yugoslavia to stop the resettlement; they were ignored. The Serbian government started to pressure ethnic Hungarians to leave Vojvodina. 50,000 have left in recent years; most have gone to Hungary. The Hungarian government has attempted to discuss the problems of ethnic Hungarians in the province with the Yugoslavian government. The latter refuses to talk. Slogans have appeared on homes and public buildings in the province saying: "Hungarians: Your God is dead and doesn't care for you anymore." The Democratic Community of Hungarians in Vojvodina (DCHV) issued a statement referring to a "sinister plan for the final solution of purging Vojvodina of its non-Serb ethnic population." Today, only about 17% of the province's population of 2 million are ethnic Hungarians. "The Conflict in the former Yugoslavia and autonomous region of Vojvodina, and the need for a more coherent U.S. foreign policy," The Stanton Group, 1993-NOV-11. Human Rights Watch/Helsinki, P. 5; cited in reference 7. T Carpenter & P. Kislitsyn, "NATO expansion flashpoint #2: The border between Hungary and Serbia," Cato Institute, 1997-NOV-24.